Detailed scale model designed for adult collectors and is not intended for play. This product is not suitable for children under 36 months as it may have sharp edges and small parts. Any problems?. Hornby R602. Power Clips. OO/HO Gauge. 5 out of 5 stars - Hornby R602. Power Clips. OO/HO Gauge. 14 product ratings14 product ratings - Hornby R602. Power Clips. OO/HO Gauge. 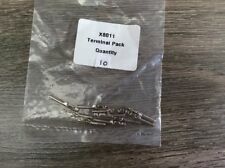 This auction is for a pack of 10 genuine Hornby power clip terminal pins. Part number X8011. For use with Hornby track power clips, power connection tracks (R8241, R8206), R044/R046/R047 switches, controller wires, old-style point motors and motorised signals etc. Can be crimped or soldered to the ends of wires. I will post free via Royal Mail 2nd class within 24 hours of payment. It will be securely package for delivery. Please refer to pictures and feel free to contact me, Andy, with any questions. Thanks and happy bidding. Hornby Power Clip X 2 & Uncoupler. Can be crimped or soldered to the ends of wires. Hornby Trains Sets. LINK WIRES. TOP categories. Sylvanian Familes. Tamiya RC Cars. Sylvanian Families. Plastic Model Kits. Scalextric Cars. Condition Used. UK despatch only. Goods will be well protected. Part Number: R602. We will always help you to have a 100% positive happy buying experience. Add to favourites. Part Number: R8242. Power clip for installing wires into a DCC model railway. Just insert two wires into the back of the clip and slide the clip (Prongs First) between the sleepers. We will always help you to have a 100% positive happy buying experience. BOXED: No. Get In Touch. Get Social. Important Information. WORKING ORDER: Yes. 1x R612 Point. unused Condition removed from sets. 2x R620 uncoupler. 24x R605 std Curve. 8x R607 Lg Rad Curve. 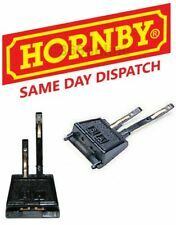 R602 Hornby Power Clip. Used model railways & collections always wanted. How it started; I have been interested in model trains since I was a child. It was more fun and much cheaper, now I can fix most locos so they run like new.